'Stephen King's slim new novel tackles weighty matters' - New York PostCastle Rock is a small town, where word gets around quickly. That's why Scott Carey wants to confide only in his friend Doctor Bob Ellis about his strange condition: he's losing weight, without getting thinner, and the scales register the same when he is in his clothes or out of them, however heavy they are. Scott also has new neighbours, who have opened a 'fine dining experience' in town, although it's an experience being shunned by the locals; Deidre McComb and her wife Missy Donaldson don't exactly fit in with the community's expectations. And now Scott seems trapped in a feud with the couple over their dogs dropping their business on his lawn. Missy may be friendly, but Deidre is cold as ice. As the town prepares for its annual Thanksgiving 12k run, Scott starts to understand the prejudices his neighbours face and he tries to help. Unlikely alliances form and the mystery of Scott's affliction brings out the best in people who have indulged the worst in themselves and others. From master storyteller Stephen King, our 'most precious renewable resource, like Shakespeare in the malleability of his work' (Guardian), comes this timely, upbeat tale about finding common ground despite deep-rooted differences. 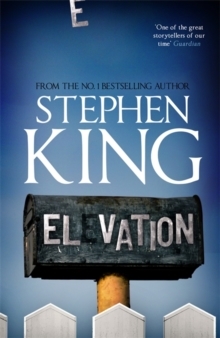 Compelling and eerie, Elevation is as gloriously joyful (with a twinge of deep sadness) as 'It's a Wonderful Life.' Includes illustrations (c) Mark Edward Geyer.